The composer's third opera met with acclaim, despite a turbulent genesis. Any Italian opera composer who dared to peek out from behind a music score in the 1880s had to face head on opera’s éminence grise, Giuseppe Verdi. Verdi was a national hero, a warrior against both foreign occupation and artistic corruption. But there was another equally imposing figure lurking just beyond: Richard Wagner, who, in his own lifetime and well beyond, cast a long shadow over the theory and practice of opera. How then, was Puccini to carve out a niche while cowering in the face of two operatic giants? The fact that he was able to achieve so much seems nothing short of miraculous, but he most surely paid a price for it. As a novice composer barely out of conservatory in the early 1880s, Puccini had been introduced to the young poet Ferdinando Fontana. Fontana's suggested source for Puccini's first opera was Alphonse Karr’s 1852 short story Les Willis (which had already been told in Adolphe Adam’s ballet Giselle). The favourable reception of Le villi (1883) led Puccini back to Fontana for his next work, Edgar (1889), which did not generate the same enthusiasm – in part because their chosen source material, Alfred de Musset’s 1831 dramatic poem La Coupe et les lèvres (The Cup and the Lips), was never intended for the stage. By 1893, one can imagine Puccini’s publisher, the deeply vexed Giulio Ricordi, wringing his hands over a talented but pathologically insecure composer of growing popularity. The failure of Edgar had forced Puccini into silence; he couldn’t find the right subject and rejected numerous scenarios proposed by Ricordi and a number of colleagues. As it gradually became clear, Puccini was searching for something with ‘colour’. He needed a particular kind of subject that would allow him to match sound with image. It may be that the genesis of no other of Puccini’s operas was more fraught than that of Manon Lescaut. Ricordi discouraged Puccini from undertaking to adapt Prévost's novel, which had already inspired operas by Massenet and Auber – but the composer seems not to have been able to resist another opportunity to ride the current of proven success. It didn’t turn out to be easy, however. Probably still feeling the negative consequences of his work with the kind but inexperienced Fontana, Puccini set out to craft his own libretto for Manon Lescaut. What follows is a sometimes dizzying tangle of events. Ricordi had approached the playwright Marco Praga. Praga, however, crafted only a scenario, which was then entrusted to Domenico Oliva, a theatre critic and journalist. But Oliva did not exactly fit the bill, and Ricordi wanted Puccini to collaborate with a professional librettist. He suggested Giuseppe Giacosa, whom Puccini then rejected because he had not liked a scenario that Giacosa had proposed earlier. Puccini then approached his old friend Ruggero Leoncavallo (who would later feud openly with Puccini over rights to the subject of La bohème). Praga and Oliva crafted a libretto in four acts, the second of which was eventually dropped because it followed Massenet’s opera too closely. Subsequently, Giacosa was called back, along with Luigi Illica, who would make corrections, eliminate the second act and also refine a new Act III. In the end even Ricordi himself would write some verses for Act III. 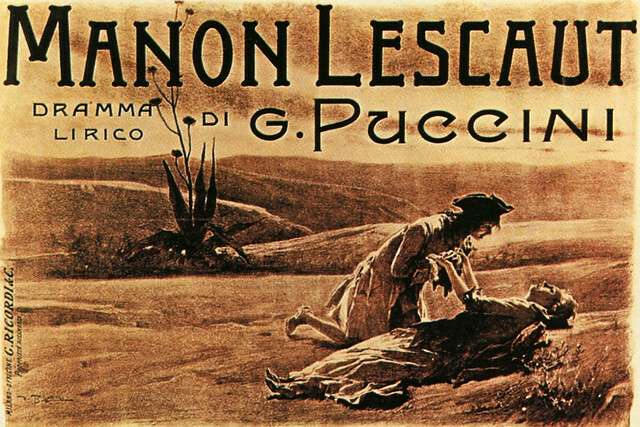 It thus took a veritable village of librettists – Puccini, Giacosa, Illica, Praga, Oliva, Leoncavallo and Ricordi – to lift Manon Lescaut off the ground. In the end, none of them took credit for the job.